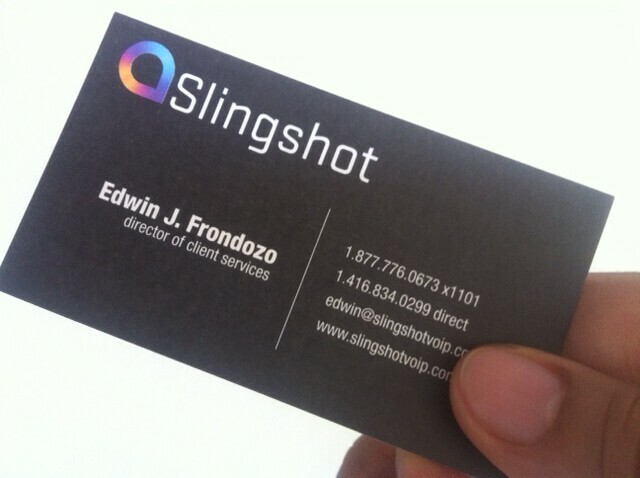 Slingshot VoIP | CES 2013: What does your business card read? How does your business card read & sound? With the tech world gearing up for the largest trade-show of the year, the Consumer Electornics Show (CES 2013) in Las Vegas, and the rest of the world eagerly awaiting to see and hear what is in store for them with regards to new gadgets, apps, entertainment, and what is coming in the near future – someone like myself cannot wait! Why don’t we put all the buzz and excitement of CES 2013 aside for a minute and take a step back to realize that trade-shows like this offer many of us a good opportunity to network. Trade-shows like CES 2013 provide an amazing platform to meet other like minded individuals like business owners, consultants, entrepreneurs, bloggers, marketing folks, product managers, and/or technology fanatics like myself and create new connections. Trade-shows breaks the ice and allow everyone to be open and say a quick hello, how are you, and what do you do much more easier than in an everyday setting. After trading cards and promising to keep in touch, what overall impression did you leave your new friend? What messages are you leaving your new connection and most importantly, what information do you have on your business card? Why not start 2013 by providing contacts, colleagues and prospective customers with a universal business number that shows you are a serious about your business and have invested in its telecommunications’ image and infrastructure.